Taiwanese site Apple.pro today posted a photo [Google translation] claimed to be of the dock connector and cable for the next-generation iPhone. 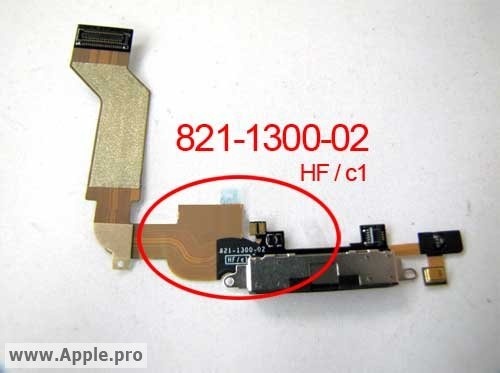 The part is nearly identical to the corresponding part found in the current iPhone, with the main exception of a slightly narrower connector and cable where the part connects to the device's main board. The connector carries a part number of 821-1300-02, compared to 821-1281-A for the Verizon iPhone and 821-1093-A for the original iPhone 4. It may also be somewhat notable that this part exists in the first place, if it is indeed legitimate, as it would confirm that Apple is continuing to use the dock connector on the next-generation iPhone rather than shifting entirely to a different standard. The European Commission recently implemented a micro-USB universal charger standard, leading to some speculation that Apple would have to include such a port in addition to or instead of the existing dock connector, but Apple can meet the new requirements by simply including a dock connector to micro-USB adapter. It is not entirely clear from the automated translation of today's post, but the author also seems to assert that the recently-claimed larger screen for the iPhone 5 is indeed a fake, possibly claiming knowledge of a four-inch screen only in a slider form factor previously rumored by the site. We continue to have a hard time believing that Apple is planning to release an iPhone with slide-out keyboard, but it is certainly possible that the company has developed internal prototypes simply to assess its options. Apple.pro has, however, posted legitimate photos of a number of parts for unreleased Apple products in the past, most recently with a small touchscreen revealed last July that ended up in the new iPod nano a few months later, supporting claims of authenticity of the new photo.